Don't you love fall colors and smells?!? What beautiful things you all made. Your arrangement at the end is beautiful. 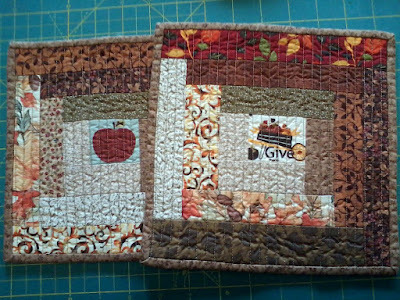 Beautiful stitch work, the hot pads are so pretty and I love your fall decorating. I do really love to decorate in the fall most of all. If you e-mail me at pammyphelps.com, I will send you my new address. An enjoyable post. Love your projects! And I do love fall also! The hots pads are really pretty. The thing I like about fall the most is the changing colors of the trees and the soups and baking that usually resume once the cool weather arrives. So beautiful! We still have the quilt and use it often! It is still so beautiful and holding up well after 3 plus years!